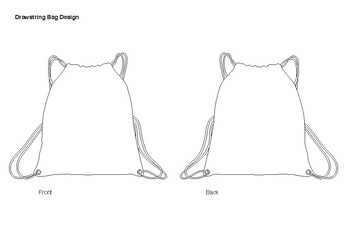 Drawstring Bag Design Template A4 size (210mm x 297mm) or 8.26" x 11.69"
A blank drawstring bag design template that can be used for a quick art or design task or as an addition to a longer project. As a quick task I typically ask students to create 3 draft ideas in their sketch books and then pick one to present as a final design on this template. Template shows a simple outline of a tote back, showing front and back panels. Template has been created A4 paper size (210mm x 297mm) or 8.26" x 11.69"
Graphics are suitable to be scaled up or down, or to print 'fit to page' as needed.